Meanwhile, the arrival of active duty military forces is making some residents nervous along the border. EL PASO — President Donald Trump on Thursday doubled down on his intent to militarize and fortify the border against a caravan of Central American asylum-seekers slowly making their way toward the United States, saying his administration recently did away with "catch and release" for undocumented immigrants and plans to erect tents to hold future border crossers — including their children — until their immigration cases are resolved. Trump offered no details on how his administration would be able to indefinitely hold families for long periods and still comply with a court settlement known as the Flores agreement that limits how long undocumented minors can be detained by the government. He also didn't provide details on the number or location of the tents but said they're necessary to stop a coming "invasion" of migrants. "These illegal caravans will not be allowed into the United States and they should turn back now," Trump said. "We're putting up massive cities of tents, the military is helping us incredibly well." He also said any asylum-seeker who throws rocks at U.S. military personnel will be considered to be carrying a weapon. "Anybody throwing stones, rocks like they did to Mexico, and the Mexican military ... we will consider that a firearm," he said. But despite Trump's claim of ending catch and release, a shelter director in El Paso said just hours before the president's speech that he was alerted by immigration authorities that more than 300 immigrants would be released into the El Paso community because Immigration and Customs Enforcement officials don't have the space to detain the immigrants after they apply for asylum. A current tent facility in Tornillo was recently expanded to hold 3,800 immigrants, up from the 400 or so the facility held earlier this year. That facility is designated as a holding center for unaccompanied minors who cross into the U.S. illegally. It was the latest in a series of presidential declarations about immigration in the runup to Tuesday's midterm elections. Last week, Trump said he was contemplating an executive order to end birthright citizenship — although constitutional experts say the president doesn't have that power — then announced a military deployment to the southern border that started with a promise of 5,200 troops and has since increased. 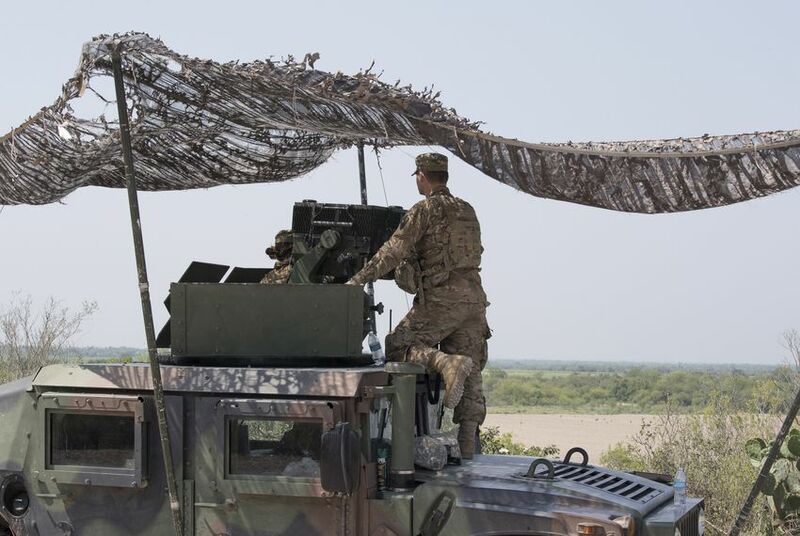 Catherine Tactaquin, executive director of the California-based National Network for Immigrant and Refugee Rights, said the move to send troops to the border is an “election-period stunt” that carries severe implications for border communities. The military operation, which has been dubbed “Faithful Patriot” will send between 7,000 and 15,000 troops to the U.S-Mexico border, 2,000 of whom are either en route or are already in Texas, according to federal officials. A Department of Defense fact sheet on the operation provided to The Texas Tribune shows that soldiers will be deployed from at least nine states and more than a dozen military installations to “coordinate operation, engineering, medical, and logistic support” with the Department of Homeland Security. Along the border, the arrival of active duty military forces is making some residents nervous. Bishop Garrison, an Army veteran who served in Operation Iraqi Freedom and currently serves as the interim executive director of the Truman National Security Project, a progressive policy think tank, was stationed at El Paso’s Fort Bliss during his military service. He said border residents have a reason to worry about their cities turning into militarized zones in the coming days. In nearby Progreso, a small town on the Rio Grande, chain-link gates have been installed on the pedestrian walkways of an international bridge connecting the town with Nuevo Progreso, Mexico. Sandra Cavazos, a spokesperson for Customs and Border Protection’s office on the bridge, declined to comment about the installation of the gates. As the migrant caravan makes its way through southern Mexico, migrants who have already reached the border have recently started camping out on the international bridge connecting El Paso and Juarez as they wait to present themselves at the port of entry and request asylum. Customs and Border Protection officials have been stationed at the bridge for months and have routinely turned back would-be asylum-seekers before they cross the international boundary. Agency officials say that’s because they don’t have room to process the influx of immigrants seeking safe haven. Garrison, the El Paso military analyst, said trade and everyday cross-border travel at the international bridges could be affected by the troop deployment. During a press conference announcing the operation on Monday, Customs and Border Protection Commissioner Kevin K. McAleenan said his agency would try to “maintain lawful trade and travel to the greatest extent possible.” But Garrison said it’s unlikely that daily commerce won’t be affected. “I am incredulous, I find that very hard to believe,” he said. Texas would be the hardest hit by any slowdown. From January to August of this year, the Laredo customs district, which includes the Rio Grande Valley, has processed more than $153 billion in two-way trade with Mexico, according to WorldCity, a Florida-based company that analyzes trade data. The El Paso district, which includes New Mexico, has processed almost $52 billion. U.S. Rep. Vicente Gonzalez, D-McAllen, said he doesn't expect the military deployment to affect cross-border trade in his district. Hannah Wiley and Teo Armus contributed to this story.